Live Data for Equity, Future & Options, Commodity and Currency. Real Time Data for Amibroker at Electrifying Speed RT Data for Commodity, Equity, Futures & Options and Currency. Searching for reliable Real Time Data Feed for Amibroker? You are at right place as at ValueRT.com we provide RT Data Feed for Amibroker for Commodity, Equity, Futures, Options and Currency Segments. Download ValueRT Data App and Get Free Trial for Real Time Data for Amibroker. ValueRT is one of the Best RTDS Data Provider for Amibroker in India. We are one of the Best Amibroker RT Data Feed Provider. Our RT Data App for Windows is very user friendly and can connect with Amibroker Automatically for Tick By Tick Data in Amibroker. However, Backfill upto 90 days comes with 1 minute time frame. End of Day (EOD) Data comes free for all segments after subscription. We are leading stock market data provider in India. Commodity Future Real Time Data comes for most active symbols. Equity Future Symbols Real Time Data Feed for Amibroker comes for all Futures Symbols for Current Month and Data is Continuation in Nature. Subscribe for Commodity Live Data and Real Time Data Feed Now. We provide Indian Stock and Commodity Market Real Time Data for Amibroker version 5.4 and above. We are Now Providing Real Time Data for Metastock. Our Data is Compatible with Metastock professional Version. Tick by tick Data is updated for amibroker through multiple dedicated servers for smooth data flow. Best Quality RT Data for Amibroker (2-4 sec delayed) for equity, commodity, F&O and Currency with open interest. 1-Min timeframe data backfill upto 90 days can be taken from RT Data App compatible with Windows XP and above. Data saved on user's machine, upto 99 symbols per feed updated simultaneously, compatible on VPS/Servers/LAN. Minimum System Required: Microsoft Win.XP-SP3, Dual Core with 2GB RAM, .Net Framework 4.0 Client Profile, 10" Screen. Excellent online technical remote support provided by expert staff from Monday to Friday (08.00 am to 07.00 pm). We Provide Realtime Data for Amibroker. ValueRT Data App updates live charts Tick by Tick with 1 Minute Historical Data Backfill upto 90 days. 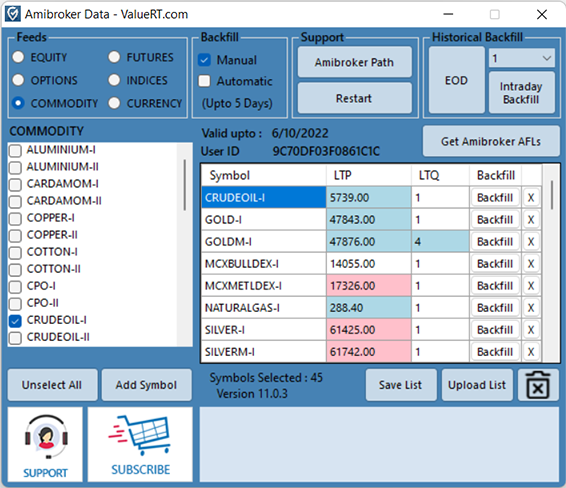 ValueRT is one of the Leading Stock Market Data Provider for Amibroker Data Feeder, Share Market Live Data and Data Feeds for Amibroker. Easy to use RT Data Feed App is compatible for Windows XP(SP3), Windows 7, Windows 8/8.1, Windows 10 and can be used for Real Time Data for Amibroker version 5.4 and above. It feeds Data Feed for NSE Equity, NSE Futures, Nifty Options, MCX Commodity and NSE Currency Segments with lowest latency. EOD Data for Amibroker is Available Free of cost to all Intraday Data Subscribers. However, End-of-Day data for all segments alone is also available for subscription. • Get Four Most Popular Amibroker AFLs for Buy Sell Signals with Any Feed Annual Subscription. Download RT Data Setup from above link and install on Windows PC. Download RT Data Setup from above link ad install on Windows PC. Download RT Data User Manual for all features and instructions. High Speed Realtime Data Feed for Commodity, Equity, Futures, Options and Currency Compatible with Amibroker Ver 5.4 and above. Accurate Data at Electrifying Speed with Highest Accuracy and Open Interest in Derivatives. ValueRT strive to be the Best Realtime Stock Market Data Provider and Amibroker Live Data. Our Real Time Data Services are available for Amibroker Data, Live Futures Data, Equity Intraday Data, Commodity Real time Data, Data Feed for Amibroker and Live Data for Amibroker. ValueRT is Amibroker Real Time Market Data Provider. Excellent After Sales Live Support available from 8.00 am to 7.00 pm.